Phenolic insulation boards available in the Australian market come from all over the world. 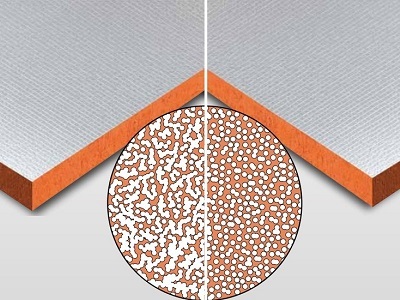 When comparing different phenolic solid foam insulation panels, it is important to distinguish between ‘open cell’ and ‘closed cell’ designs, as their respective performance characteristics vary widely. One must know how to tell them apart because what might look the same on the outside may not always be the same on the inside. In open cell foam, the blowing agent forms irregular pockets (or cells) that are linked together into a continuous interconnected capillary network. Since these cells are open, the blowing agent will quickly disperse into the atmosphere and the cells will refill with the surrounding air. Immediate transfer of air or water vapour is enabled through the ‘open’ or ‘porous’ interconnected material structure, similar to a sponge. The effect of replacing the very low conduction gas with air is to diminish the thermal resistance of the material significantly. An example of open cell foam is a bath sponge where water can easily flow through the entire structure, displacing the air. Closed cell materials, by contrast, feature millions of unconnected microscopic intact bubbles, which effectively contain the blowing agent long term. Closed cell structure foams also have higher dimensional stability and low moisture absorption coefficients compared to open cell foams. Pool noodles are an example of closed cell foam, where the gas pockets are sealed from each other to prevent moisture ingress. The qualitative differences between closed and open cell systems can be measured accurately using a pycnometer, which measures the impenetrable volume of the sample by gas. Test methods should conform to EN ISO 4590 standards (or equivalent), and the product tested should be easily identified on the test report by its product name, description and any other definitive characteristics reported, such as the foam density. In closed cell phenolic foams, the conductivity value, also known as the lambda value of the final foam is directly related to the lambda value of the blowing agent that is present in the final product as the cell gas. The high thermal performance of the foam comes from the retention of this blowing agent in the closed cell structure. High quality closed cell phenolic foam has at least 90% closed cell content, which can produce approximately double the R-value of open cell foams. Poorer quality foam insulation may have a high percentage of closed cells but the cell walls may be of inferior quality and have ‘windows’, or holes that allow the gas to escape over time. In open cell phenolic foams, blowing agents leak out of the porous material to be replaced by air. The degree of movement through the body of the material is dependent on a range of factors, including the size and density of the cells, moisture ingress, as well as the chemical composition of the material itself. This can effectively cause a 50% reduction in the thermal performance of the product. What’s important to note is that porous, sponge-like characteristics are not ideal features of insulation. Quite simply, any flow through an insulating material is self-defeating as it facilitates unwanted energy transference. This is why only an aged R-value is a true representation of the performance of foam and, therefore, should be used for declaration instead of the R-value achieved immediately after manufacture. Aging standards recognise the effect of leakage and stipulate that declared R-values should take this into account to gain a more accurate measure of long term performance of the insulation. Kooltherm insulation boards from Kingspan Insulation incorporate a high-quality closed cell phenolic foam with negligible open cell content (2%), providing an ultra-low thermal conductivity (lambda value λ) and, therefore, a very high R-value. Its sound cell structure, tiny cell diameter and premium CFC/HCFC-free blowing agent clearly distinguish it from its competitors. Importantly, the superior closed cell technology of Kingspan Kooltherm will provide reliable long term thermal performance. What is the open cell content of the product? Remember that high open cell content means low thermal performance. Have aging standards been applied to the R-value declarations? Remember that aging standards take into account the long term thermal performance of the product, not its performance immediately after manufacture.